Founded in 1959, Aston & Fincher are one of the leading suppliers of hair and beauty products in the UK with a retail footprint of over 33 stores. Serving the professional services industry for over fifty years, Aston & Fincher are trusted by experts and professionals to provide an extensive catalogue of high-quality products. Aston & Fincher serve two distinct markets: hair and beauty. When they approached CTI, Aston & Fincher were operating two separate websites. 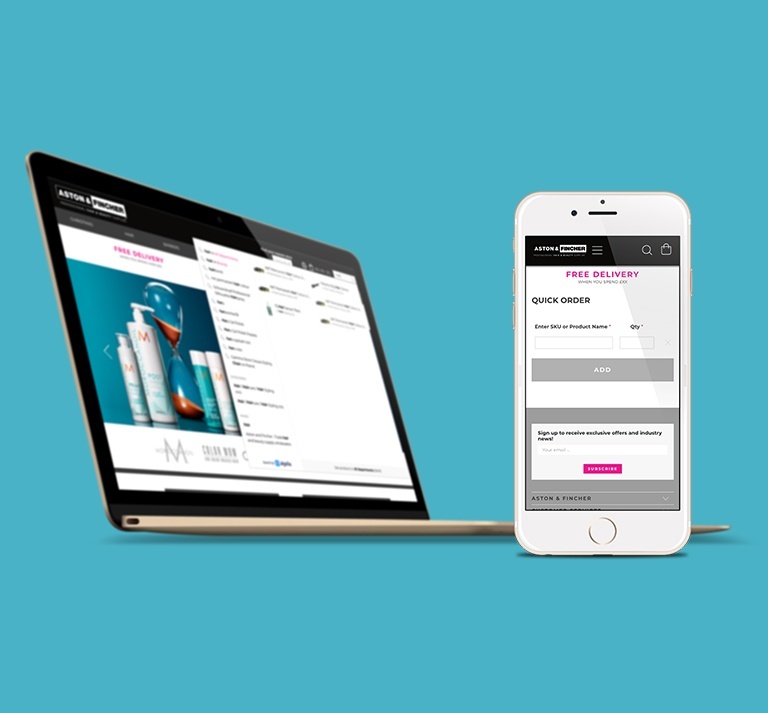 Their original Magento 1 site sold both hair and beauty products; but the acquisition of 'Your Salon Store', a bespoke platform built to serve beauty products alone, saw Aston & Fincher forced to run two systems side by side until a solution was found. Aston & Fincher came to CTI with a clear vision in mind: the company wanted to streamline their operations and reduce total cost of ownership by re-platforming to Magento 2, whilst seamlessly re-branding both sites to become 'Aston & Fincher Hair and Beauty'. This change would see consumers able to purchase from Aston & Fincher's entire hair and beauty catalogue on a single website. 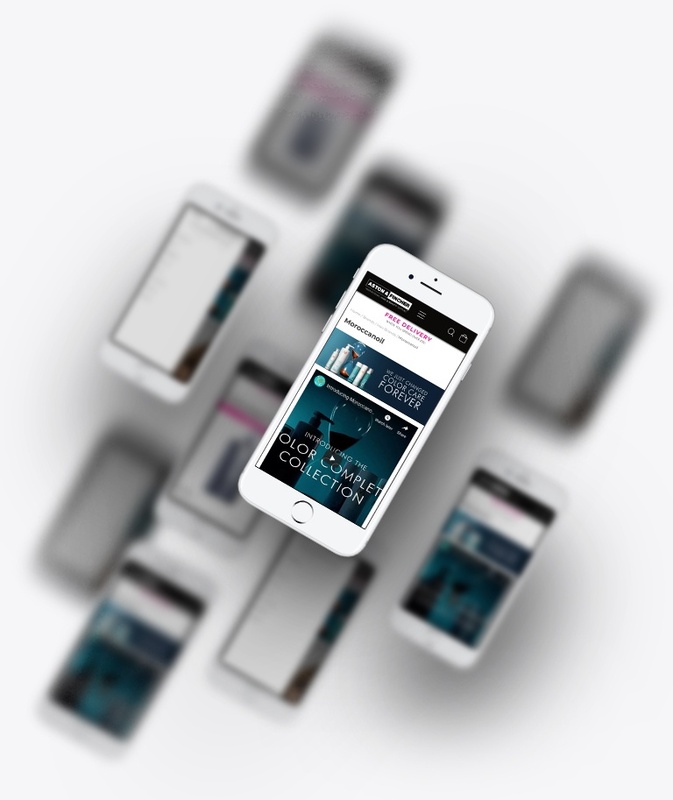 Finally, the new website would be approached from a mobile-first standpoint and implement a responsive web-design that was representative of their brand image. In order to achieve the project vision, we needed to migrate data from two different websites running on two entirely separate platforms. By bringing both former sites together, we were able to streamline business operations for Aston & Fincher. With a long-standing heritage in the hair and beauty industry, it was important to retain historical order information. This seamless migration of data allows Aston & Fincher to recognise their loyal clients and continue to deliver excellent customer service. The new website features a useful ‘Store Locator’ search function, powered by Google Maps. 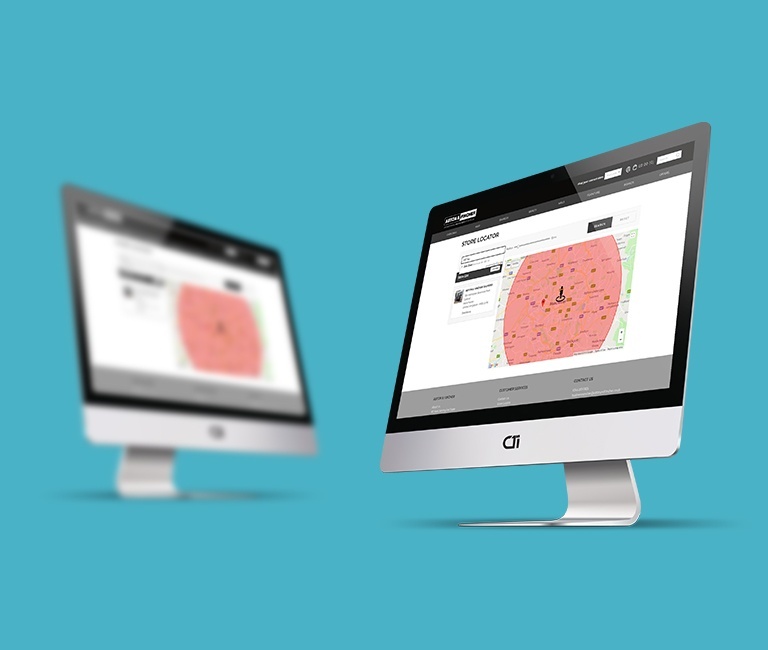 Users are able to input their postcode, resulting in a map view of nearest locations, address details and street view. Each listing also offers the chance to search for directions, according to several modes of transport, to make it easier than ever for customers to access the variety of store locations. This is particularly useful in line with the offer to ‘Click and Collect’, reducing cost and complexity in the delivery process. We replaced the standard Magento search module with Algolia search. This powerful search function indexes products, categories and, unusually for eCommerce sites, CMS pages. As such, Aston & Fincher are able to ensure user engagement with a wider range of content and website pages. Beyond this, Algolia search caters for misspellings and synonyms, to provide suggestions and recommendations, never leaving a query unanswered. Reaching the search results page, products can be filtered by category and type, as well as ranked in terms of relevance, name, brand and price. With a vast range of products, it is vital that the user can browse, search and find their ideal purchase as easily as possible. In order to speed up the checkout process, we have developed a custom-built module for address look-up. Once a customer begins to populate the address field, Google Maps integration suggests the most likely addresses to be automatically input. We have made this module readily available on Magento open source, and also integrated it into Aston & Fincher’s checkout process, to optimise the customer experience. Aimed at the B2B consumer, Aston & Fincher have been circulating a suppliers catalogue for a number of years. As a result, many customers want the ability to build a basket featuring multiple products quickly. In order to serve this consumer need, we developed a ‘quick order form’ feature, to help businesses to purchase efficiently. Customers can skip the need to search through the extensive product range. Simply entering the known catalogue code (SKU) and quantity (QTY) will allow you checkout quicker than ever before. In order to facilitate manageable customer service and to encourage engagement, we integrated Mailchimp as the chosen email marketing software. Aston & Fincher are now able to easily manage their targeted email campaigns. This includes automating emails such as ‘Cart Recovery’ and ‘Abandoned Basket Reminders’, to promote customer conversions. By integrating email marketing with Magento, Aston & Fincher can enhance and personalise their customer outreach, ensuring that they reach the right users, at the right place and time. All of our projects undergo rigorous testing, throughout the software development process. In order to deliver the utmost quality for clients and their respective users, our in-house QA team ensure that all end products perform accurately and reliably under normal and abnormal conditions. Testing is followed by continual monitoring of software performance, to prevent reoccurrence of any issues and to ensure efficient ongoing operation. As such, we were able to confidently deliver a well-designed, scalable and technically stable result. The new site presents a sleek and easy-to-use interface, for both customers and Aston & Fincher employees. Hosting all products and processes in a single location enables this long-established business to continue providing for hair and beauty professionals nationwide. See the results for yourself on the Aston and Fincher website.